CIRENCESTER, UK -- March 9, 2015: Less than one year from launch the Mitsubishi Outlander PHEV has now overtaken every other plug-in hybrid and pure electric car, even passing vehicles that have been on sale since 2011, such as the Nissan Leaf, to become the UK’s favourite plug-in vehicle. By the end of March, sales of the Mitsubishi Outlander PHEV will have passed the 10,000 mark. 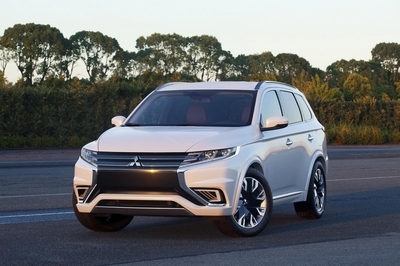 Mitsubishi’s Outlander Plug-in electric vehicle (PHEV) has transformed the plug-in market. The Outlander PHEV has an all-electric range of up to 32.5 miles and phenomenal economy and environmental credentials. It emits just 44g/km of CO2 and the official combined fuel consumption figure is 148mpg. And, critically, it is available at the same price to the customer as the equivalent specification Outlander diesel. The company is seeing a strong and sustained period of growth. Mitsubishi Motors’ UK passenger car sales for February 2015 are 178 per cent up on the same month last year against a market that is up 12 per cent, according to latest figures released by the SMMT. The company’s ASX active sports cross-over car is 92 per cent up year to date, the result of a high profile TV and press marketing campaign. The iconic L200 pick-up vehicle is making a dramatic impact in the retail sales sector. It is 42 per cent ahead of the same month last year, following the launch of the L200 Challenger – the company’s best ever value for money pick-up. February retail sales for Outlander diesel and Shogun are equally impressive, up 67 per cent and 77 per cent respectively compared with 2014.